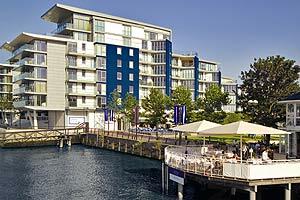 Early 2015 saw Titan Products supply 300+ FCU-4 combined heating and cooling controls and RDU-4 user interfaces to the Wandsworth Riverside development, London. Offering reliable, accurate and efficient control the FCU-4 controller was supplied pre-programmed specifically for the project ensuring the control requirements were met successfully. The project requirements called for fan coil cooling and under floor heating which was achieved using the FCU-4 controller’s flexible outputs. This allowed both the heating and cooling systems to be controlled via the one controller which meant that the two systems never fought each other allowing for maximum levels of energy efficiency to be achieved. 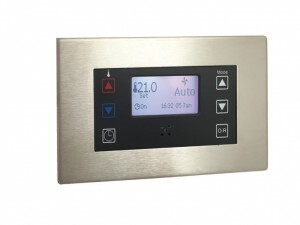 Designed to effortlessly and efficiently control the apartment fan coil units and under floor heating, the FCU-4 controllers were supplied complete with an in-built time clock which was controlled by the apartments master RDU-4 user interface. This allows the occupant to set their 7 day time schedule effortlessly from the easy to use menus within the RDU-4 for the whole apartment. Simple override buttons on all RDU-4′s within the apartment allow the time schedule to be overridden quickly if the occupant wishes. Control flexibility was enhanced further with each time period having the option for a different temperature profile to control against. The RDU-4 user interface also offers an intuitive button layout for the user to easily adjust their desired temperature set point and switch between cooling only, heating only or AUTO control modes. All FCU-4 controllers are supplied with BACnet communications as standard to ensure seamless integration to a building BMS if required. With the option to control 0-10V or relay fans, 0-10V or 24v AC valve actuators and wealth of control options including fabric protection control limits, frost protection and system flush regimes as standard, the FCU-4 and RDU-4 products from Titan Products are the ideal control solution to for your project. For more information on the FCU-4 and the RDU-4 product ranges please contact the sales team on 0161 406 6480 or email admin@titanproducts.com. Broadgate Tower benefits from Titan's Fan Coil Controllers.